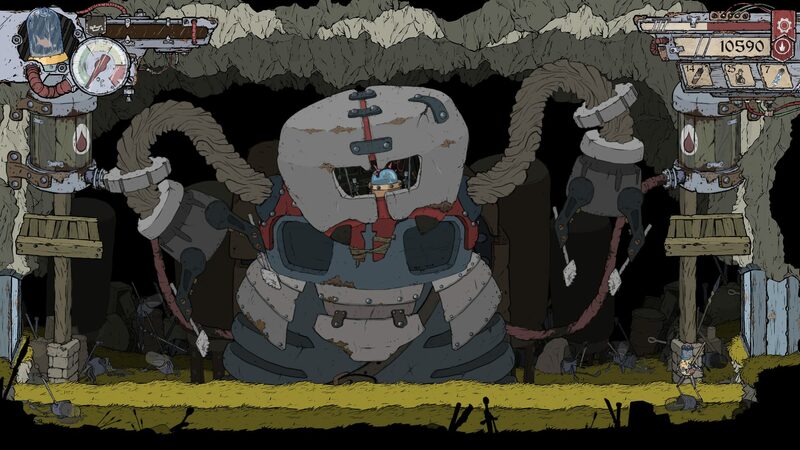 Feudal Alloy’s weird premise doesn’t go anywhere, but the combat and visuals create a Metroidvania you can, quite literally, easily get lost in. 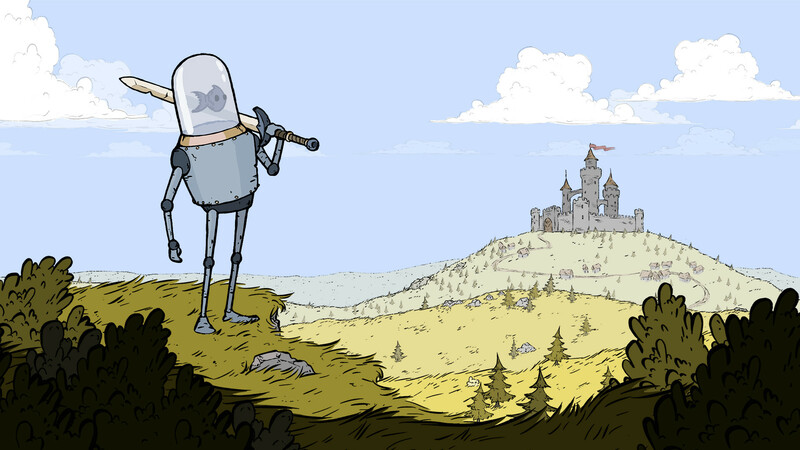 Feudal Alloy is set in a world filled with robots, and the fish controlling them. It might be a reasonable idea that fish will outlive humanity and take over the world someday, but the game doesn’t bother giving an actual reason for why they are now walking (or swimming) around this medieval land in metal exoskeletons. It took three years for the Czech indie studio Attu Games to release Feudal Alloy, their second game. Attu Game is a tiny studio consisting only two members that have to take care of almost everything the game needs, and they’ve done it quite well. The game tells the story of Attu, a peasant that grows sunflowers for noble reasons – producing oil for veteran old robots. One day, several outlaw robots come and steal the precious oil. Naturally, Attu takes up his old blade and goes after them. Nothing too fishy. If you’re hoping for anything more complicated than that, you’re in for a disappointment. There aren’t any cut-scenes, dialogues of any kind or any elements that tell you of the progress you’re making. Maybe it’s because fish can’t talk. Whatever the reason behind it, you’ll forget the plot quicker than a goldfish forgets where it is (yes, I know it’s a myth; just go with it). Luckily, you are a human, so even if you forget why you’re wandering around a medieval world as a goldfish controlling a robot, you will definitely remember the gameplay. On his way, Attu faces many robots who attack him on sight. Some of them are small and rather easy to deal with, and others are pesky and annoying nuisances. Most of the robots have several versions depending on where you find them. The base robots are unarmored and relatively small in comparison with their advanced forms. Most of the time, you can avoid the mean robots if you’re quick enough, but I found that sometimes it’ll be best to crack them open and quietly search the room to discover all its secrets. 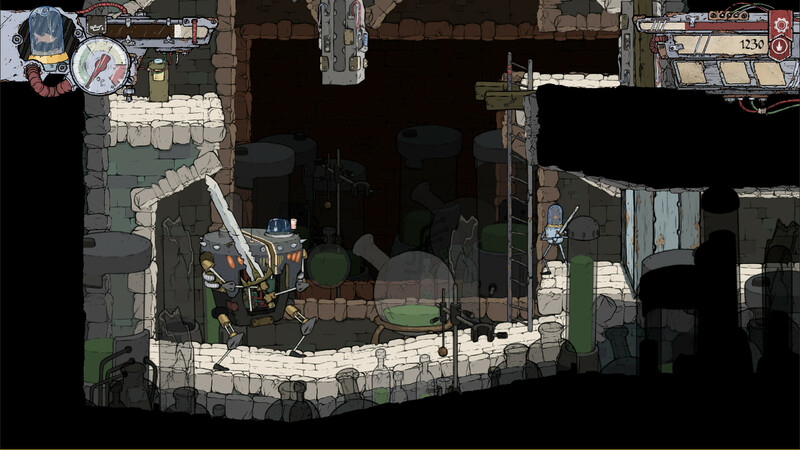 Feudal Alloy is a Metroidvania, so there’s always a lot of exploring and back-tracking to do. Unfortunately, it’s also easy to get lost while doing so. For example, once you find a key to a locked door, there’s no way of knowing where the door is unless you remember its exact location. Searching all over the map every time you need to find a specific spot can really grind your gears, and the respawning enemies don’t help. The map doesn’t give you a lot to work with, either. You only see your current position, checkpoints, merchant tents and teleporting stations locations. Teleporting stations give you the option of fast travel. The game doesn’t tell you that they are, and you’ll have to fish for answers all by yourselves unless you read this review or followed the creators’ tweets. Teleporting leaves you overheated, so you can’t rush into a fight immediately after doing so. It’s important to take notice of the three main bars on the screen: the oil bar that shows your current health, the temperature bar, and the upgrade (or loot) bar. Using abilities and attacks will raise your temperature gradually until you overheat, then you’ll need a little time to cool down before you can strike again. Freeze potions will give you the ability to use several skills without heating up for a limited time. It’s even more essential to observe your health and temperature bars when encountering an ambush if you don’t want to end up as a pile of scrap. Ambush rooms are easy to recognize due to a checkpoint post that refills your oil tank. There are checkpoint posts that are not near an ambush, but it’s a good rule of thumb to be prepared when you see one. And boy, will you need it. Every ambush poses a new challenge, with a distinct enemy and trap combination and patterns to learn and analyze. Depending on your skills, you can find some of them to be reasonably easy and some hard and annoying and even slightly unfair. Be sure to have some oil tanks and freeze potions to spare, and never, ever use them when an enemy is creeping up behind your tail – their slow animation can leave you defenseless. Some rooms contain the bosses. The boss fights are challenging, but after figuring out exactly what you need to whack all that is left is memorizing the boss’s patterns and strike when you see a window. Whenever you overcome an enemy, you collect gears, electric parts, and screws that’ll fill your upgrade bar. It takes time, but you won’t even notice it while you’re wandering around, fighting the many enemies. Once filled – the upgrade bar resets, replenishes your health and gives you a skill point to spend on the different skill trees. It doesn’t matter which one you unlock first since it happens quite frequently. One handy skill I strongly recommend to go for is the Auto-Collecting skill that’ll help you to fish more loot out of enemies and collect if faster. Another way to upgrade your robot is by changing parts and weapons. You can do it in two ways: buying it in merchant tents scattered around the map, or finding parts in loot chests. The different body parts and blades are made from various metals such as steel, copper, and titanium, and get better and shinier as you progress through the game. These components can upgrade stats such as oil capacity, overall temperature (raising the overheat temperature) armor and damage. You can also buy oil cans, freeze potions and several types of bombs to help you on your venture. However, if you play the game with just enough skill, you might not need them. 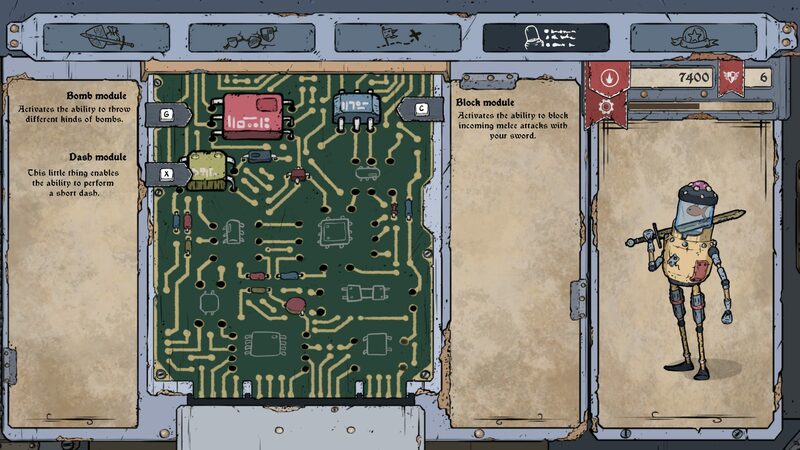 The third upgrading system is the only one you’ll need to follow to finish Feudal Alloy. Usually, after a hard ambush or a boss fight, you’ll find a special module that allows you to use a new ability. Some are simple like dashing and double jumping, while some are used to open locked pathways. As you unlock more modules, the platforming sections get more complicated, and you’ll have to combine several abilities with perfect timing to cross them in one piece. 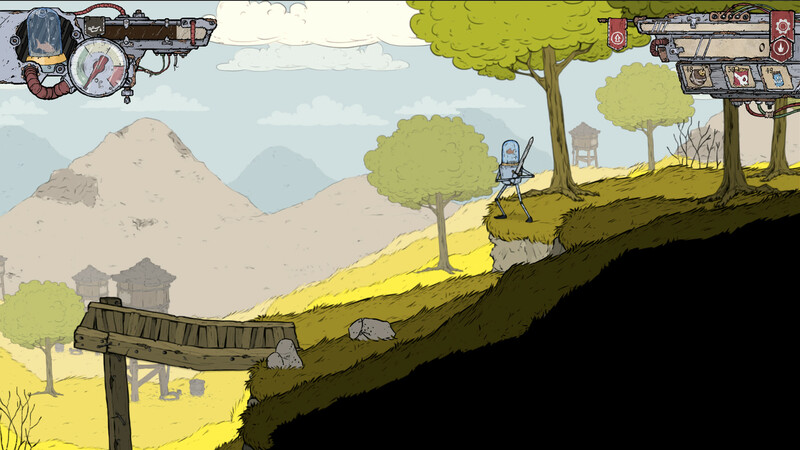 Feudal Alloy has a lovely hand-drawn design that gives every region its own characteristics. The animations are just right, with appropriate sound effects to accompany them. It’s recommended you don’t mute the game, as some sound effects will let you know if the enemy robots have spotted you, or alert you that a certain attack is coming your way. My favorite sound effect is when you try to perform an action that’s unavailable at the time (like attacking while Attu is overheated) – Attu makes a disapproving, cute mechanic voice. The music embraces the medieval elements and gives you a knightly feeling. The soundtrack is relaxed and pleasant in the simple rooms, and gets more intense in ambush and boss rooms, as expected. A horse robot was the only thing missing from this robo-knight fantasy setting. The soundtrack is the single aspect the developers didn’t do by themselves, but they chose an artist who grasped the concept and adjusted the music to resonate with the game design. Feudal Alloy takes the silly idea of fish-powered robots and uses it to create a fun Metroidvania you can easily get lost in, sometimes quite literally. A more detailed map could also have saved me some frustration and pointless backtracking, but the combat is balanced just so that it doesn’t become a chore to kill all the respawning enemies. Luckily, there are just the right RPG elements to keep a steady sense of progression the story fails to deliver, but I still wish the game could incorporate its premise into the world-building in a more interesting way. 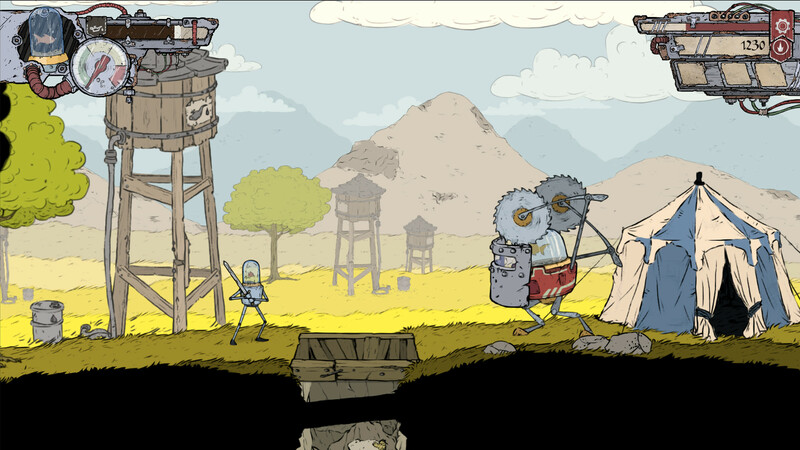 Feudal Alloy is certainly a charming game, thanks to its visuals, music, and deadly goldfish enemies. Lovers of both marine biology and action – this one is for you.